Keeping the same page numbers as the NIV Pew Bible, this Larger Print edition helps those with ailing sight read along with everyone else in your congregation. This traditional hardback burgundy NIV Bible has 11pt print, making it easier to read for those who prefer larger text. The text is very clearly laid out on the page in two elegant columns, with minimal show-though. The cover design is the same as the standard NIV Popular Burgundy Hardback Bible (ISBN 9781444701487) which matches the stock of burgundy hardback pew Bibles churches will already have. The pagination is also the same, so everyone can turn to the same page when a reference is given out in church. It also features Old and New Testament maps, shortcuts to key stories, events and people of the Bible, a reading plan and Bible guide, quick links to find inspiration and help in different life situations, and British spelling, grammar and punctuation. 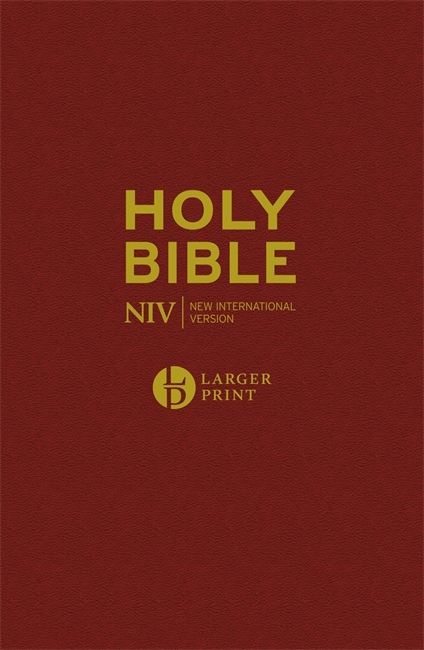 NIV Larger Print Burgundy Hardback Bible by New International Version was published by Hodder & Stoughton General Division in April 2017 and is our 331st best seller. The ISBN for NIV Larger Print Burgundy Hardback Bible is 9781473651562. Be the first to review NIV Larger Print Burgundy Hardback Bible! Got a question? No problem! Just click here to ask us about NIV Larger Print Burgundy Hardback Bible. Is this the same version of the text as your product code 3703003? Would this work as a lectern bible matched with the other product as a pew Bible?